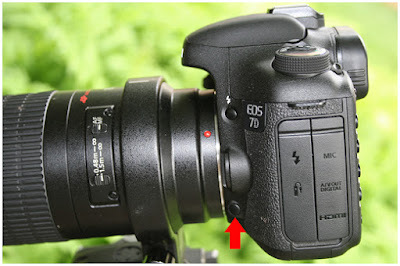 For this week's Thursday Tips I want to talk about one of my favorite features on my relatively new Canon 7D; Live View. I will focus on how you can use Live View to produce more careful compositions, particularly for landscape and macro photography. If your current camera model does not have Live View, most of these tips are still applicable to composing through the viewfinder; Live View just makes it a lot easier. By pressing the info button, you can add a lot of information into the Live View Frame (including histogram information); however, I prefer to leave the screen simple most of the time to facilitate good composition. I do leave the exposure information on the bottom turned on, as that info does not impinge on the viewing frame. First an illustration for orientation. Most of the benefits of using Live View disappear if you are trying to handhold your camera. Indeed trying to use Live View while shooting handheld introduces further instability into your image-making by removing a point of contact with your body (your eye/head and the viewfinder). Live View makes it much easier to check the edges of the frame for distracting or impinging elements. 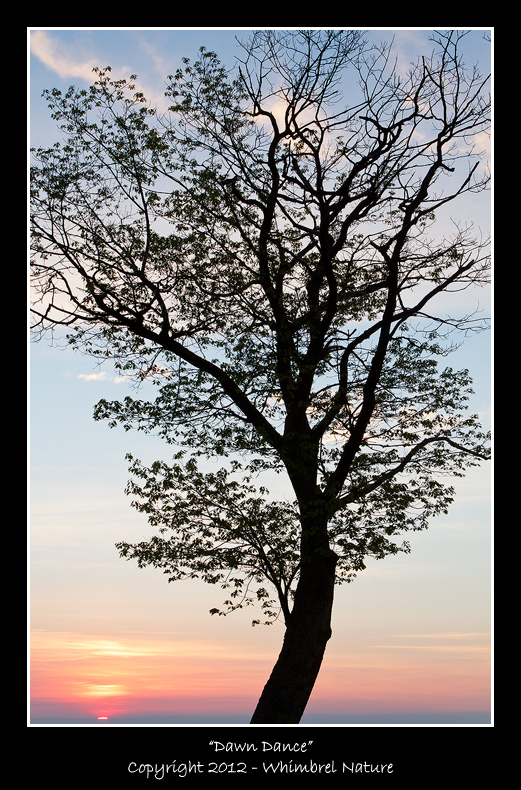 For example, a nearby foreground branch impinging on your landscape composition. When we look through the viewfinder image particularly, our tendency is to focus more on the center of the frame and our main subject. It is easy to miss elements on the edge that detract from the composition. By making the image larger and allowing us to step back and see the whole frame at once, Live View really facilitates this process. Often having strong lines leading directly into (or out of) the corner of the frame makes for a bad composition. So check for those strong lines and shift them out of the corner (at least slightly) if at all possible. Note, just like any other "composition rules", this one is made to be broken under the right circumstances. For example, broader strong lines, like a major branch of a tree can look good going into the corner, particularly if the edges don't hit directly in the corner. Again, while we are focusing on the the main subject, it is easy to miss distracting background elements or hot spots/highlights that can ruin an otherwise spectacular image. If you notice these distracting background elements, consider adjusting your depth of field (see below), adjusting your perspective/angle (including using a longer focal length to narrow background coverage), or manipulating the lighting of the background, wherever possible. 5. Check your depth of field (DOF). Using the DOF preview button (see illustration below) you can manually stop down the lens to your chosen aperture. This will allow you to preview the depth of field and make sure that all critical elements are in proper focus and/or ensure that distracting background elements are sufficiently blurred. Note that stopping down the lens reduces the amount of light coming through to produce the Live View (or viewfinder) image. 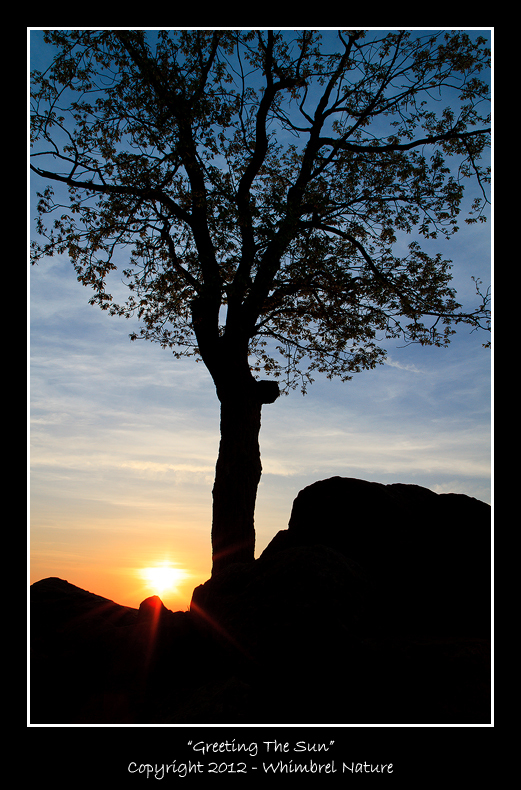 In low light conditions and/or with very small apertures, the image can become so dark that this feature is of limited value. On most Canon and Nikon models (and many others) the DOF button is located on the bottom left-hand side near the lens mount. This is one invaluable feature of Live View that you can't do through your standard viewfinder. Many models with Live View allow you to magnify the image to facilitate manual focusing and to check critical focus. 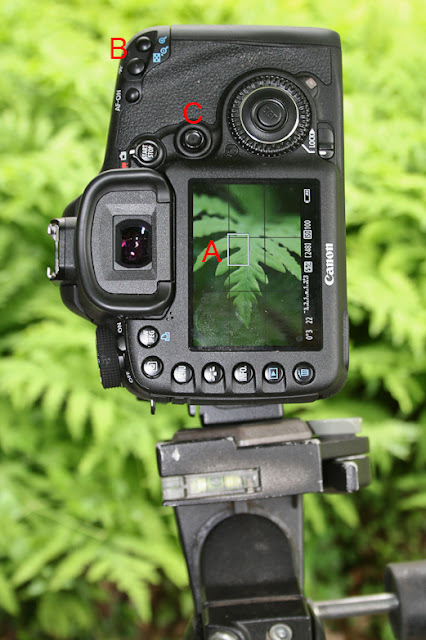 Move the magnifying frame (A) using the multi-controller button (C) so that the frame is centered on the area of critical focus for the image. Then press the magnify button (B) to zoom in to 5x view. I usually use this magnification to focus, but on my 7D you can also press the button a second time to get 10x magnification. Depending on the situation, the digital noise and/or subject/camera movement present at this magnification can limit its usefulness for critical focusing. Pressing the button a third time will return the normal image. Hope these tips help you compose critically and use Live View to your advantage. Do you have other tips for using Live View? Leave them in the comments section below. Great info and I love the tree pics. I haven't tried Live View on my D300 because I mostly photograph very active subjects but this post has got me thinking I should try it when I am photographing flowers & landscapes. Thanks Frank and Mia. @Mia, yes I just love that tree. With that arch in the trunk it really looks like it is throwing up its branches in a joyous dance. Also, I now find myself photographing landscapes and macros/flowers pretty much exclusively with Live View. In fact, I find it hard to go back to the viewfinder when needed. It's like having a mini view camera 8-). Nice post! I've not tried it yet since I usually am shooting handheld but this makes me want to try it out. Thanks! I have been mightily frustrated with the LiveView on my Nikon D5100 - possibly because I usually handhold my photos. As you say, the key probably is to put it on a tripod.